The CA05 Series Pull-Type Core Aerators are perfect for garden tractors, zero turn mowers and utility vehicles to relieve soil compaction, and allow air circulation in grassy surfaces. They are designed for residential use and other light applications. They utilize replaceable hardened spring steel spoons mounted on rotating discs. These spoons pull cores up to 2 1/2" in length from the soil profile. The spoons are spaced laterally every 4". Pulled cores are deposited on the surface for subsequent drying, pulverization, or removal. Weight can be added to the weight tray to help achieve maximum spoon penetration. Pull Type Clevis Hitch: Fits behind any small tractor, lawn tractor, utility vehicle or ATV with a pull tongue. 3 Sizes 40", 48" & 56": Great sizes for residential home owners and other light applications. Formed 10 Ga. end panels and center supports: Offers good strength and appearance. Formed 12 Ga. weight tray with drain holes: Adds safety over spoon area, doesn't allow foreign weight object to fall into spoon area, keeps cores from being thrown forward. 16 Ga. x 1/2" I.D. hardened spring steel spoons with beveled edge: Penetrates the ground easier than spoons constructed of a heaver gage material and/or larger diameter bodies. Individual Spoon Replacement: Requires removal of only two bolts to replace a worn-out spoon. Don't have to disassemble the whole rotor section to get to the spoons. Gang greasing: Each gang has a grease zerk for smooth rotation. 8 1/2" Spoon spacing (forward travel). 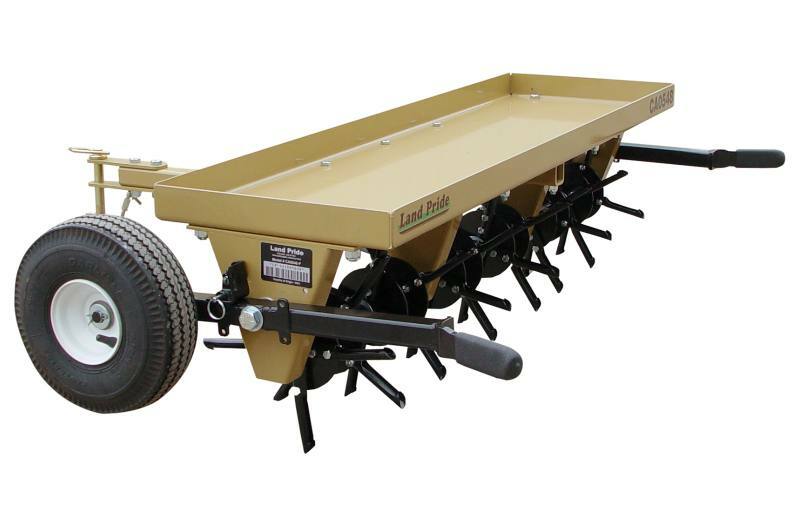 4" Spoon spacing laterally: Offers optimum core pulling pattern & aeration. 4.2 Aeration cores per sq. 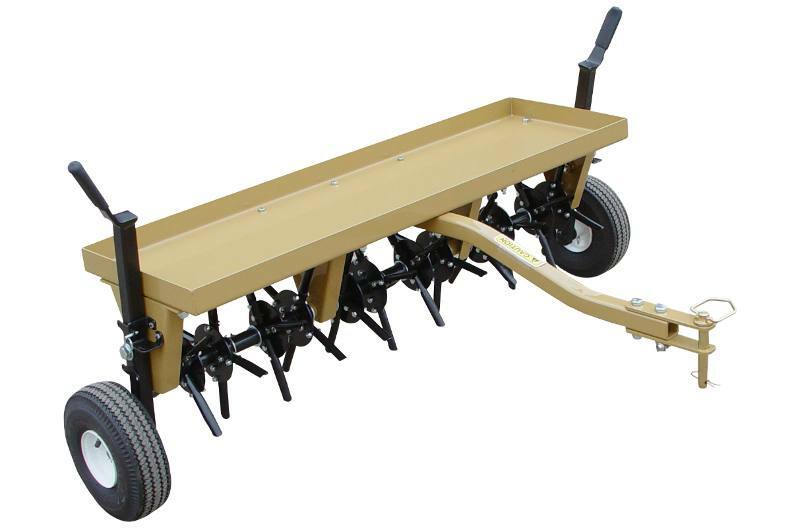 ft.: Provides good aeration per square foot. Weight tray: Additional weight can be easily added to the aerator. Overall Height: 27 1/4 in. Max. Allowable added Weight in Tray: 300 lb. Spoon Material: 16Ga. hardened spring steel, Replaceable. Spoon Spacing in forward travel: 8 1/2 in. Spoon Spacing laterally: 4 in. Spoon Penetration: 3 in. Depending on ground conditions and added weights.